A repeating theme heard in performance analysis discussions is that “Performance doesn’t prove doping.” Of course this is true because proof, as an absolute, doesn’t really exist. Instead, most real-world evidence driven judgments are based on probability and not “proof.” From this perspective, this post will illustrate the concept of using a mathematical model to estimate the probability of doping as a function of performance. In this review, the prevalence is estimated from 14-39%. The mean would be 31%, but for the sake of giving cycling the benefit of the doubt I used 25%. 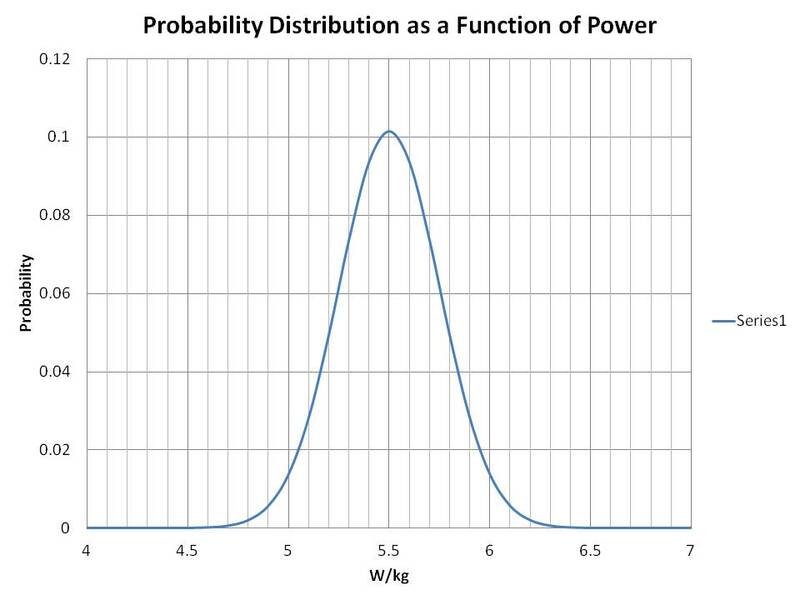 Using, the distribution function above and number of clean riders we can generate the distribution of clean riders as a function of power. As you can see this model predicts 1-2 riders above 6 W/kg and 1-2 riders below 5 W/kg. Since O2 metabolism is the primary determinant of endurance performance it can be extrapolated from this study that a 10% increase in performance from O2 vector doping alone may still be possible. However to stay reasonably conservative I used a 5% benefit from doping. So now a second probability function is made with the mean in creased by 5%. The standard deviation is unchanged. 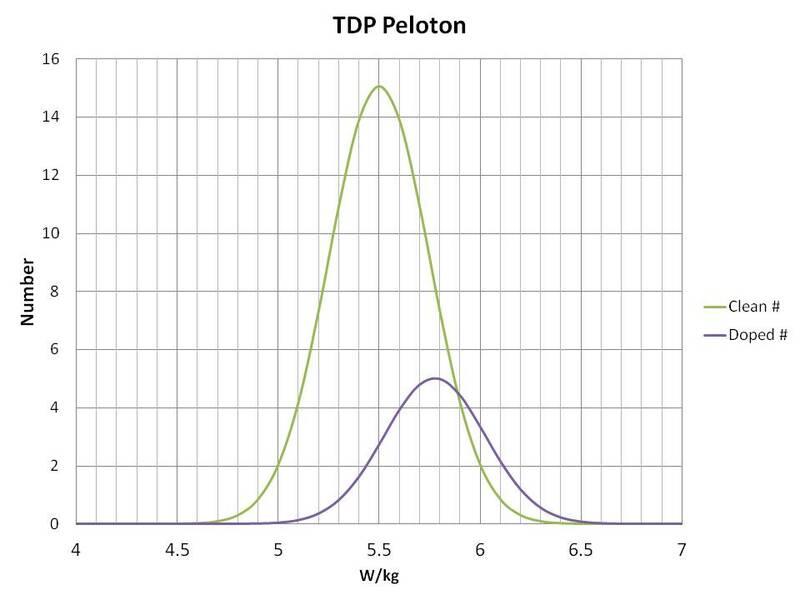 From the probability distribution and the estimated prevalence of 25% doping we can now generate the distribution of doped riders as a function of power and overlay that with the clean rider distribution. This figure should start giving you some clue as to why it is misleading to say that “performance doesn’t prove” anything. 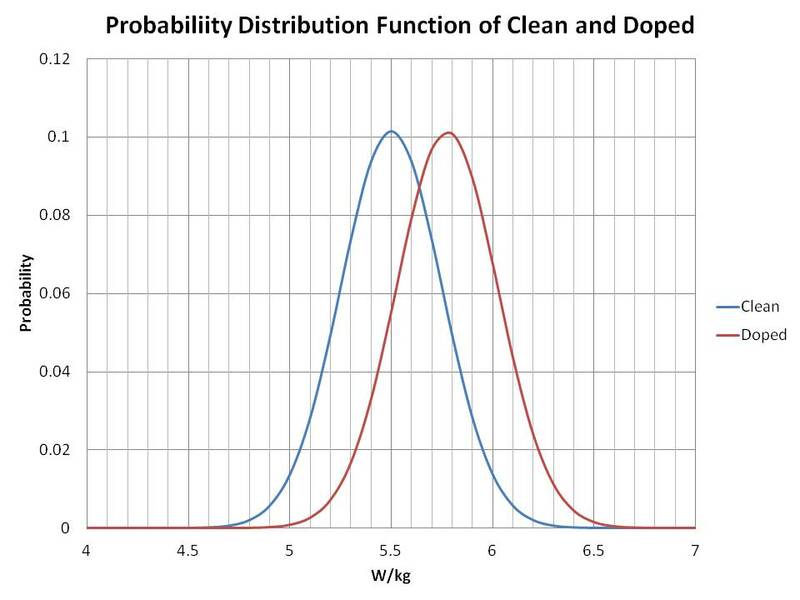 Finally, from the distribution models we can calculate the probability that a level of performance is likely to be produced by a clean versus doped rider. 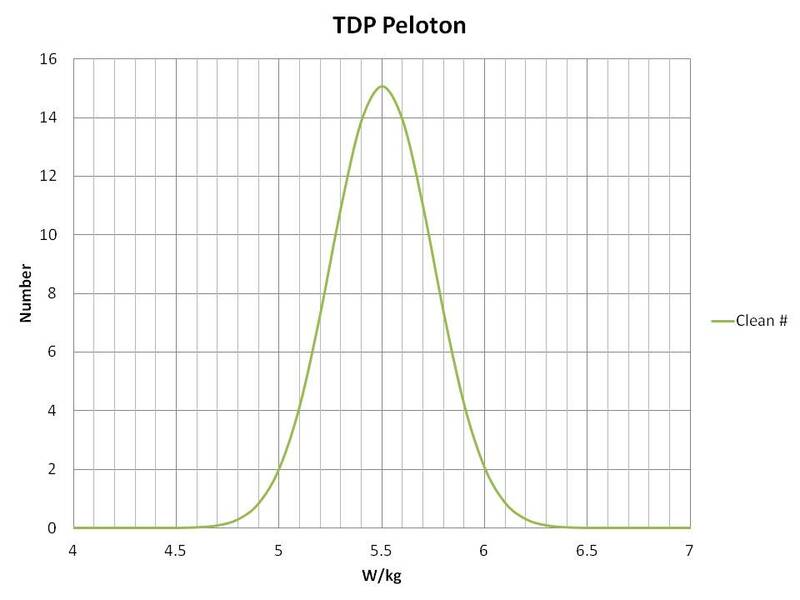 As you can see based on this model and the assumptions above, the probability of doping at the 6 W/kg performance level on a prototypical climb is about 60%. 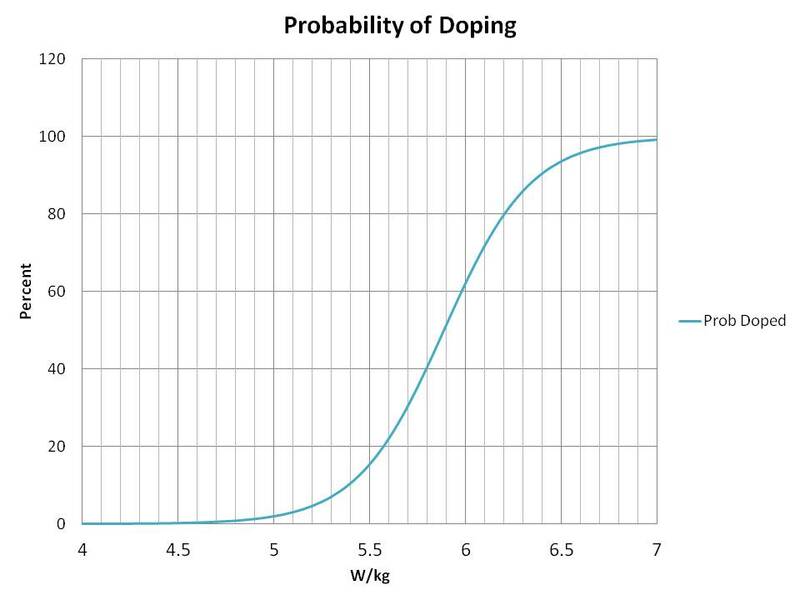 The probability of doping increases to 80% at 6.2 W/kg, and approaches 100% at 7 W/kg. This model/example is meant to be illustrative of the concept. With better input and more sophisticated modelling, performance could be realistically used as an indirect measure of doping probability. Triangulating across multiple indirect measures including biological, performance, and psychometric measures would likely improve our understanding of the true doping burden on sport. If you would like to experiment with the model it is available at the link below. The fields to manipulate are highlighted in yellow.